In the art market there’s a growing gap, both economic and cultural, between the old world and the new. In the old world, the traditional art market continues to set auction house records for art works produced at least decades and often hundreds of years ago. In the new world, we have the emergence – thanks to democratizing technologies that enable the production of high quality art at vastly reduced costs – of a new generation of artists who produce, market, and sell their art completely outside of the traditional channels. From a buyer’s perspective, the barrier to entry in the traditional art market is extremely high, and growing. $50,000 can be considered a reasonable minimum to purchase artwork through the traditional channels such as auction houses and galleries. A new generation of buyer’s however, has emerged to purchase the artwork of the new generation of artists. In this new world, which we can call the “over the counter” (OTC) art market, $5000 is considered plenty to make a purchase of high quality artwork by a well-known artist. In 1997 their databases showed 127 artistic movements since the birth of the art market. That number is now up to 325 (more than doubling in the last 20 years). Even more indicative of the rapid changes brought on by the digital revolution, regarding artistic techniques, Artprice’s art historians and experts in 1997 counted 212 artistic techniques since the origins of art. That number is now at over 850 and counting. A few more statistics illustrate clearly the changes that have come to art world. Again according to Artprice’s databases, the number of artists who have – in the traditional channels – at least one public sale to their name from the 14th century to the present day totals just 657,000. The number of actual artists in the present day, however, is much higher; Artprice estimates 1.2 million living OTC artists. These are people defined as those whose primary source of income is the art they produce, yet to the traditional art world, they hardly exist. Taking just one genre of art – “street art” – we can see, again according to Artprice’s data, that the traditional market has represented fewer than 3,285 Street artists – ever – yet more than 125,000 Street artists currently live off their work. Adding to this 1.2 million OTC artists, we have an even larger pool of what may be termed “part-time artists.” Artprice has developed analytic tools with strict criteria to select OTC artists on Facebook whose pages are exclusively dedicated to their artistic production and distribution. The result: at least 1.8 million pages. All of these artists crave access to global sales networks. If they get it, they will thrive, and by extension so will art itself. While VooGlue has in its roadmap a plan to enable buyer access to highly priced “traditional artwork” through its tokenization and listing on our marketplace, it’s these OTC artists who form our primary initial market. VooGlue’s gluing of a digital multimedia counterpart to a wall hung artwork – which itself can be considered a new artistic technique to be added to the 850 and counting documented by artprice.com – is another tool that artists can use to promote and monetize their art. VooGlue is actively adding selected seeder artists to its platform to experiment with this new style and movement, and create collaborations between art, music and film. 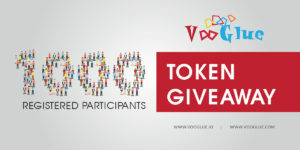 Additionally, VooGlue’s system of affiliate links in combination with the creation of a marketplace that enables low-cost transactions for the buying and selling of art, add to OTC artists’ ability to disseminate and profit from their work. By serving them, we aim to push forward the quality of art itself. 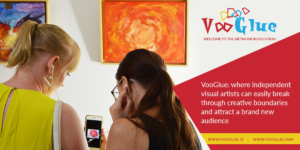 For more information on how to benefit from connecting digital media to your artwork through the VooGlue app, please contact pr@vooglue.io. The decentralization movement is currently experiencing massive growth thanks to distributed ledger technology (“blockchain”). This movement and the technology that supports it are set to have a huge positive impact on the art industry in the coming years. The impact includes the protection of artists’ rights, the improvement of investors’ access to art, the opening up of an overtly centralized art community, the enabling of galleries to finance more purchases, the crowdfunding of art projects, and even the addition of an extra dimension to art itself. All of this together has the potential to usher in a renaissance of art over the coming years. The changes on the horizon are many, but the lowest hanging fruit is the recording of an artwork’s provenance on a public blockchain. This is likely to be the first innovation to positively affect the art world and will form the foundation upon which all other benefits of the decentralization model are built. At any point in a work of art’s history, its authenticity can come into question. Art is often accompanied by documentation (commonly known as provenance) that confirms this authenticity. Good provenance is meant to leave no doubt that a work of art is genuine. The current system of assigning provenance, however, is a fragmented patchwork of databases overseen by centuries old institutions. This system, like any that relies on a centralized trusted authority, is vulnerable to corruption and counterfeit. In the modern context, where records have been digitized and are held in centralized databases, the information additionally becomes susceptible to hacking. 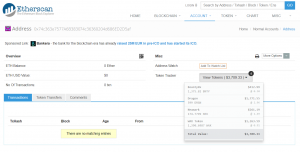 Assigning provenance using a public blockchain solves the problems of corruption, counterfeit, and hacking once and for all. A fundamental tenement of a public blockchain, after all, is that it provides a permanent immutable record in a “trustless” environment that is essentially immune to hacking. When all participants can know that a record is correct without having to trust that it is correct, there will no longer be a need to rely on centuries-old institutions to verify the authenticity of the art. All other benefits of the decentralization model flow from this initial system of immutably recorded “trustless” verification. The assignment of intellectual property rights recorded and managed on a public blockchain is a layer of information that can be added once a system of recording provenance has been established. 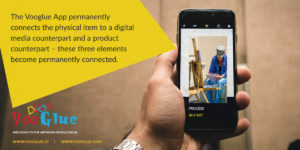 This would enable partial or complete ownership of a piece of art, particularly (at first) in a digital media like photography, to remain with the artist as the artwork is disseminated around the world. By using a public blockchain to immutably assign rights to a photograph, for example, photographers will be able to easily prove that they are the rightful owners of the copyright for that photograph. In the near future, as the information recorded in certain public blockchains becomes integrated into legal frameworks, courts will accept such information as legally valid. This will greatly reduce legal costs, cut down on unlawful duplication, and legally protect artists. When information about art is immutably recorded on a public blockchain, an artist’s rights are never forgotten or discarded. Moving forward it should be possible, therefore, to enable applications such as a system in which the art can be rented out to a gallery with the payments generated being sent directly to the artist in real-time based on the number of people who view the art. With more artists earning a fairer price for their work, the incentive to produce quality work increases, raising the overall quality of art with it. The next layer to be added to the publicly distributed “trustless” ledger of information about art is likely to be a system of “tokenization” of art. Tokenization is the process of assigning digital value to a physical object such that the value can be divided up into representative tokens which can then be freely bought and sold on an open market. The tokenization process will have a huge impact on the art industry by enabling wider investment, fairer prices, and crowdfunding models. Fine art, as an asset class, can be an integral part of a serious diversified investment portfolio. Modern art and 19th century art have in fact out-performed both the S&P 500 and T-10 Bonds since 1998. The status quo market environment, however, makes it very difficult for small and medium investors to gain access to this asset for several reasons. To begin, the safest and best performing investments into fine art are considered to be in well-known, high-priced art works. Investing in a Monet, for example, is a safer bet than investing in a lesser known artist. With Monet’s paintings being priced in the millions, however, small and medium investors are effectively priced out of the market. Next, the art market is far from liquid. The options for buying and selling fine art are extremely limited. Auction houses are perceived as the safest, but charge fees between 12–25%. Art galleries and art dealers charge less, in the range of 6–10%, but they are considered less trustworthy. Additionally the price of art is dictated by auction houses and galleries with very limited market participants, so fair price discovery can be difficult. A final additional factor that works against smaller investors is the high costs associated with the maintenance of fine art. These costs are so high that an estimated 90% of even high net-worth buyers would rather not have to personally manage the maintenance of the art they purchase. The tokenization of art presents a huge opportunity to drastically change art markets for the better by alleviating the above inefficiencies. From the buyer’s perspective, it will now be possible to own a piece of an expensive work of art. This is something that is particularly valuable for small investors who, due to the barriers to entry described above, have so far been unable to meaningfully invest in fine art. Imagine someone wanted to invest $100,000 in fine art to diversify their portfolio. Currently they would only have access to less expensive (poor “performing”) artworks. But by tokenizing a Monet, for example, anyone could in theory buy a piece of it, thus gaining access to the best performing art investments. Next is liquidity. By enabling a more transparent market in which a much larger pool of participants have access to a much larger pool of provenance-verified artworks in a “trustless” environment that largely eliminates the need for intermediaries, a vastly more efficient and liquid market is created. In this environment, not only can overall fees be drastically reduced, but also fair market prices can emerge. Finally there are maintenance costs. When purchasing a portion of an artwork that has been tokenized, the arrangement could be such that the artwork itself is maintained by an agreed upon professional custodian who already has the resources and experience required to maintain a collection under the highest standards. The cost of this maintenance is distributed across all token holders and because the art itself is maintained by professionals and doesn’t have to be moved, efficiencies are achieved. The increased pool of art investors and improved efficiencies enabled by tokenizing art should equate to significantly more demand for fine art, leading to a gradual overall increasing of art prices and by extension, an explosion in the production of new art. From the seller’s perspective, the implications are no less profound. Imagine a serious art collector or a gallery that wants to expand their collection but lacks the funds to do so. Previously they would have the option of, for example, getting a 3-year art-secured loan at 13.5% annual interest. On a million dollar work of art, this would come to $400,000 interest paid over three years. But by tokenizing some of the art they already own and offering it for purchase to small investors as described above, they would be able to finance their purchases at a much lower interest rate. The Maecenas project, which raised $13 million in its September ICO, claims to be able to facilitate this process at between 2–6 %. Crowdfunding using blockchain technology has exploded in the last year, making it by far most successful application of blockchain technology thus far. A version of blockchain-based crowdfunding can easily be applied to individual artists who would like to procure funding for an art project. They could make a proposal for funding, with buyers entering into the terms laid out in a smart contract. The conditions of this contract may, for example, outline a scenario in which anyone who contributes to the funding of the art project gets a proportional share of the tokenized value of that project. The artist could write the contract such that the artist maintains a share of the artwork produced, the tokens from which they would then be free to sell on the open market should they later need cash. This scenario enables the artist to get the funding they need to produce art, while still maintaining at least partial ownership of the art they produce. At the same time, it enables anyone to invest in an artist at the earliest stage, gaining ownership of the art that is eventually produced. Easier access to funding for artists combined with the direct relationship between artist and consumer enabled by this decentralized model will positively contribute to the production of more and better art. Projects currently working on all of the above features includeArtex,Maecenas, and of course VooGlue. 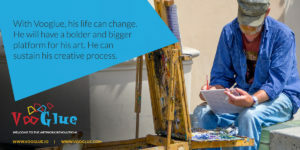 The VooGlue platform, in addition to the features described above, has already developed a prototype application that adds an extra dimension to art by giving the option to integrate a digital media counterpart into the physical art. The digital media counterpart could be something like a time-lapse video showing the process of the making of the art itself, it could be an augmented reality feature that adds to the experience of viewing the art, or it could be audio or video that is similarly designed to add to the art in some way. From a user’s perspective, the digital media counterpart can be accessed simply by pointing their mobile device at the physical artwork. 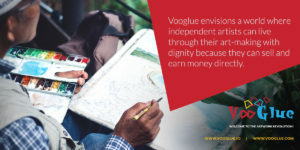 Adding an extra layer of information on the public blockchain, VooGlue permanently connects the artwork to its digital media counterpart so that the digital media becomes part of the artwork, adding to its value. The decentralization movement currently being enabled by blockchain technology gives us the opportunity to create a bigger, fairer, more transparent, and more liquid market for art. This technology also brings features that protect artists’ intellectual property rights, give them a way to raise funds for art projects, and enhance their ability to fairly earn from the work they produce. Further layers of innovation can be added to artwork, such as VooGlue’s “gluing” of multimedia counterparts to wall hung artwork. All of this combined should open up and rejuvenate the world of art for a new generation.